We left Takatz Bay, headed up Chatham Strait, then into Peril Strait and on to Deep Bay. Anchorage to anchorage is just over 53 nautical miles, one of the longer days of the trip. 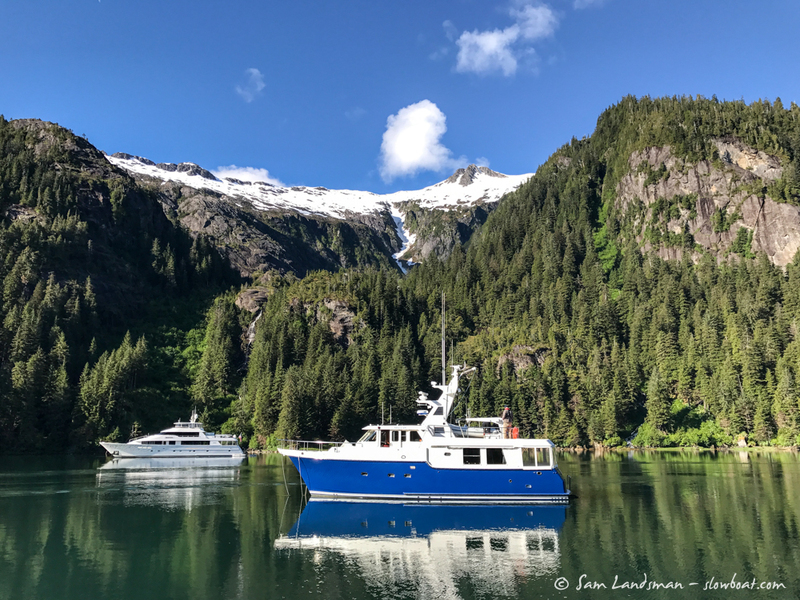 The forecast was for sun and light winds, which made it difficult to leave Takatz Bay — such a gorgeous anchorage with so much to explore — but having perfect weather for a long cruise was certainly a plus. Conditions on Chatham Strait couldn’t have been better. Glassy seas, bright sun…warmth, even! We anchored easily in 40-60 feet in Deep Bay. Deep Bay is a spacious anchorage with good holding. It’s scenic, but not all that remarkable compared to the anchorages we’d just come from. In Puget Sound or the San Juan Islands, Deep Bay would be a notable anchorage. But up here, it’s not. 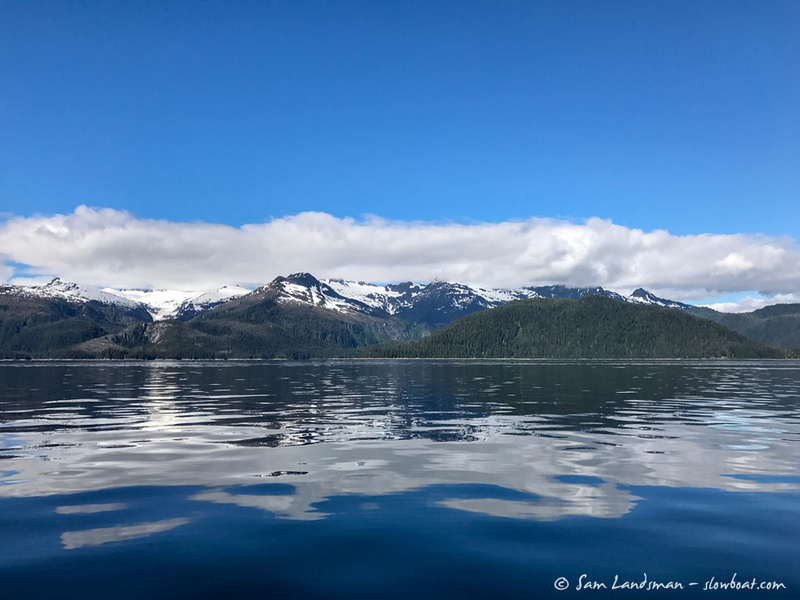 Exploring Southeast Alaska prefers nearby Baby Bear Bay. We’re not exactly sure why. Yes, Baby Bear is better protected, but piles of rocks litter the entrance channel, making it much more difficult and risky to get inside. Deep Bay isn’t as intimate as Baby Bear, but we think it’s just as pretty and a whole lot less stressful. Perhaps the best attribute of both Deep Bay and Baby Bear Bay is their location, just a few miles east of Sergius Narrows. Current runs to 9 knots in Sergius, and it’s best run near slack. Overnighting at Deep Bay or Baby Bear Bay makes it easy to hit an early slack heading west or stop for the night after a late slack heading east. Even though we felt like this spot wasn’t going to be the best for aerial photos, Kevin took the drone up to get a few overview shots anyway. Looking away from shore out into Deep Bay. Note the shoal, faintly seen in the foreground, with crab traps (white dots) just beyond. Once high enough to get a good perspective, turns out…the landscape was not boring at all! We invited everyone over to Safe Harbour/Airship for happy hour and dinner. It was so nice out we decided to fire up the grills and spend some time outside! Later in the evening we were treated to a dramatic sunset.